my last card has gone off and my last present is bought, what a relief, now I can get down to enjoying the countdown to Christmas, hope all your preparations are now well underway. As some of you say you miss the questions I have another one for you today, What is your favourite crafting tool or product?, Mine? well its a hard one but I have to say Photoglue, it is such a quick and sure way of attaching paper and card. Just leave your answer under this post and you will be in with a chance of winning todays great Whiff of Joy stamp, and don't forget to check back tomorrow after 00:01 GMT to see if you have been lucky. Wouldn't you like to find this lovely Christmas Tree stamp under your Christmas Tree well you could find it coming through your letter box if you leave your answer to todays question at the bottom of this post and your number is chosen by Random.Org. Don't forget to visit us tomorrow to see what is behind window 17. The Winner of yesterdays lovely Charlotte and her Cat stamp was chosen by Random.Org the number is - 29 - Audris Mom from Tines Creative Corner congratulations dear, can you please e-mail us your address to enable us to get Charlotte off to you as soon as possible. If you didn't win today don't forget we have another 8 windows to open. Todays winner will be posted after 00:01 GMT tomorrow. Love this stamp thats on offer today,thanks for the chance of winning. Well, for me at the moment I really like these stickles. You can create such wonderful effects with stickles. I really like to work with them! The card today is gorgeous...just every day I come and look with eyes wide open. Such wonderful work all day long. Have a nice 16th of december...only few days to go until the holy night now. Right now I am so into using my nesties with my wizard. Now that my wizard is broken in it is awesome to use. Love the tree on your card Katharina. Thanks for the chance to win. great card and love to own that stamp thanks for the chance. This is a really hard one as like all crafters there are so many things we love, which is why our stash is always full ! If I had to choose a machine, then my cricut expression. I just love all the things you can make with this. I think my fave tool would be my QuicKutz. I rarely do a page without it!! My favourite tool hands down would have to be nestabilities. Gorgeous card! Thanks for a chance to win a beautiful stamp. I think scissors and doublesided tape. I love my cricut. It is fun for so many things. My favorite product..hmm this is a hard one, my scissors I would have to say, because I couldn't do much w/o them! Good heavens! I can't choose just ONE! So here is ONE of my favorites (there are several, though): I can't do without my Scor-Pal. I use it almost daily since I got it! I love the card (again). So many talented people out there! I think I will have to go with my cuttlebug. I call it my "cutie", lol. I also love a glue called scrappyglue from magicscraps. It glues everything: metal, ribbons, brads to paper. I love it! How does a craft hoarder pick just one? It would have to be my cuttlebug!! It seems to get used every-time a project is underway!! My favourite tool is my silhouette, it really is one of the best thing ever. Got it from my mom a year ago and if i win a stamp during this adventcalender i will give it to my mom (she's a scrapper/Cardmaker aswell) She's the best!! What a lovely Christmas tree! As for my favorite crafting tool, I'd have to say that I love my Cuttlebug and Nestabilities. My favorite tool at the present time is my Wizard and Nestabilities dies. Beautiful card, thank you for the opportunity to win some stamps. My Cuttlebug machine it never ceases to amaze me. This card is so lovely and that tree is gorgeous. Thanks for the chance to win and TFS. I would have to say my Big Shot & nesties. I also love my Fiskars finger knife. Wow, it's really hard to pick just one thing, but I have to say my favorite crafting tool is the scallop circle punch right now! I grab for it all the time! I would have to say it's my gellyroll stardust pen. It's so easy to use and dries quickly. Another favorite is the cuttlebug. That's so much fun too! I'd say my favorite tool(s) are my Copics ~ I've not picked up anything else since buying them... Love the Christmas Tree stamp! My favorite product right now is very simple! It would be glue and glitter! I am putting glitter on everything lately!! And my favorite tool would have to be my Cuttlebug! I love it! ok, let's see.....2? one product and one tool??? I will shoot for that (so I don't have to pick just one...lol). My favorite tool would have to be my scor pal...don't know what I ever did without that thing! And my favorite product would have to be....hmmm....ribbon...I use ribbon on everything!!!! I love my little Cuttlebug and embossing folders. Don't know what i did without it. Thanks for a chance to win this gorgeous stamp. I simply adore my Cuttlebug, but first and foremost, I would be lost without my bone folder. I must have clean, crisp edges! ich benutze am Liebsten den Cuttlebug, es gibt soo viele tolle stanzen und präger dafür, klasse! Hard to choose just one tool but I find I do use my Copic Spica glitter markers on every card I make...so that's my most used tool anyway. I purchased the whole set of the markers for $30 and free shipping. One of the best things I ever purchased. diese Karte ist ein Traum. Ich hab es ja noch nicht so mit dem Scrapp-Papier, aber irgendwann versuche ich es auch mal. Ich arbeite am liebsten mit dem gecuttelten Papier als HG. BEAUTIFUL stamp! Love the flowing ribbon down the tree. As for my fave tool ..... I would say that would be my Cuttlebug. I love the embossing folders and using the nestabilities with it. Love my cutting tools and glitter!!! I can't wait to see your newsletter each morning- to see your next Christmas card -and the verses are wonderful. Apart from my cutting board and craft knives,my Bind it All is busy busy busy making note books for Christmas presents this year. I think my fav Crafting Tool is my Cricut Expression. I LOVE it! Lovely card!Well it would have to be my big shot i just love it! Wow, choosing just one tool. I have a new cuttlebug so that is my favourite at the moment, but double sided tape is used every day. Just love today's card. Today's card is just beautiful! For this year it is my cuttlebug. Thank you for all the lovely presents. Fab card :) As my nephew would say - WOW BIG TREE!!! With the biggest smile you could imagine!1 and thats not just Christmas trees either!! I gan't be without glue when I scrap, that's an absolutely must! Georgoeus CArd today- I want a tree like that. My favorite tool is my 4"by 6" bypass trimmer. Eine tolle Karte ist das wieder. Ich arbeite gerne mit Scrappapier, aber auch mit gecuttelten oder selbstgemachten Papieren. Gorgeous Card, Besides all those necessities like paper, tape etc. I love my bug I use it on almost everything I make. My favourite craft tool is my Cuttlebug - I love him! Beautiful card! I have to say my fav tool is the paper cutter. I tried to go to a card making party this weekend, and it was difficult to share one cutter among 5 people. Gorgeus card and fab stamp! Only one tool, huh? Well, I couldn't do anything withouth my exacto knife. Your so sweet to do all these gift give-aways Katharina! Thank you for being so generous. I think the one tool or rather one of the tools I use the most is my cuttlebug with spellbinders. Oh goodness thats two. Well my cuttlebug first then! I absolutely adore my cuttlebug, it's the best investment I've made for a long time! Schwierig, schwierig. Bei mir wird es wohl das doppelseitige Klebeband sein ;)! Das benutze ich bei fast jeder Karte =)! I like my Cuttlebug and Quickutz. My fave crafting thing is my cuttlebug/nesties but also photoglue too. I only started to use it about 6 weeks ago and I swear it is all I will ever use from now on - I love it!!!! Hmmmmmmmmm quite a lot of favourites but seeing as my very pointed tweezers accidently got thrown out with the bits of paper the other day and I nearly went frantic searching for them in the bin I think they come pretty high up the list. To pick one fav is very hard. I have sooo many favs...heehee. I luv my Cuttlebug. I use it everytime I craft. Where do you buy your photoglue? I've never heard of it. I did a search on Ebay and nothing came up to ship to Canada :o( I like using Tacky Glue, Fabri-Tac and my Scotch ATG Tape Gun. Lordy how hard is this to answer but I couldn't be without my distress inks. Hmmmm Well right now it has to be my big shot!!!! I love it and use it for all my embossing folders and die cuts!!!! Yep it's the big shot right now! Thanks for the chance of winning another great stamp! My favourite tool or product is very difficult to pick, I loe ribbon, pretty papers, stamps etc. But for versatility I think I have to say my cuttlebug takes top spot. First of all a big thank you for Katharina and Jacqui for this great Advent Calendar!! My favourite tool is my Scotch ATG Tape Gun. My favorit tool at the moment is my ScorPal. Great sample card, it's definitely double sided tape for me, so easy to use. Thanks again for this wonderful event. My favourite crafting item would be my Bigshot. I haven't stopped using it since I had it. Nice card- Ty. I love my fiskars paper trimmer. Again a beautiul card made with a beautiful stamp! It's very hard to pick just one thing but I just looove my double sided tape. Don't do any project without it! Gorgeous card! My favourite crafting tool at the moment has to be my newly purchased Cuttlebug. I absolutely love the dry embossing you can do on it. Oooh had to think I have a pokey tool i find so usefull. Its simoly has a wooden handle and a 2"metal pin like end and is goo for soo many things!. Fantastic card. My favourite tool has to be my Photo Glue. I use it on every single item I make. My favourite crafting tools are brads! I must say that it's my pappercutter.. I wouldn't want to be without it!! My favorite tool is the original sizzix, which I have since they first came out. I use it with over 100 dies almost everyday. Jeden Tag aufs neue eine wunderschöne Karte hier! Kompliment!! LG und einen schönen Tag!! I don't have any favourites (maybe 'cause I don't have any nice cutting machines...), so I'll just say scissors. eine supi Karte und der schöne Weihnachtsbaum, schmelz dahin.Gefällt mir auch so toll. ich finde die Cuttlebug, aber auch das Scor pal super. Ich stempel aber auch gerne meine Hintergründe für die Karten. This is beautiful! I love it! The coloring is wonderful! The tree is really cool image! THanks again for wonderful prizes! For now, it's definitely flowers. Thanks for the chance of winnig! Mine is the Big Shot I was given last summer :) although I din't use it with every card, but I LOVE the neatness and the beautiful effects it creates. I would have to say double-sided tape as I have just discovered the beauty of it!!! A very pretty card, those ribbon-trees are really nice! ohhhhhhhhhhhh how i would love this stamp :)) thanks for the chance once again. Nice card! Beautiful card and the tree image is fabulous! I wouldn't be without my x-cut paper trimmer I use it to cut just about every piece of card/paper I use on my cards and scrapbook pages. Another great card. My favourite craft item would be my trusty craft knife. Thanks for the chance to win. My favorite crafting item?? Hmmm, that's a really hard one! How could I pick my favorite? Well, lately I just love my cuttlebug embossing folders, but stickles runs a close 2nd. I just love that card. The Christmas tree stamp is one of my fave WOJ stamps! Would so love to win it! Juhuiiii heute gibt es den schönen Tannenbaum von Whiff of Joy zu gewinnen (den wünsche ich mir gerne unter den Christbaum)!!! Mein bestes Stück momentan ist meine Schneidmaschine, super schnell, super gut! Beautiful card. Too bad my christmas tree doesn't look like that one. Love that stamp. Hard question for a tool junkie, but I would have to say my cuttlebug. 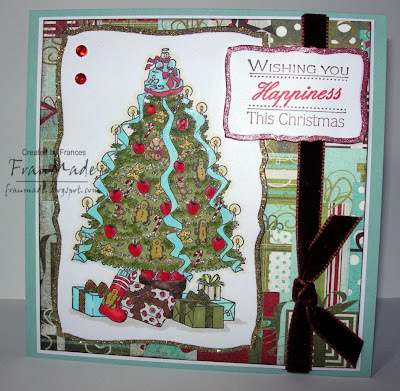 Beautiful stamp KAtharina - fab tree! Thanks for the chance to win! My favouite tool is definitely my Cuttlebug - it's just so versatile I am always diecutting and embossing with it. Right now I would say my fav crafting tool is my big shot b/c I can use it with so many other products to get the items I need to create. I love this stamp. I love to use my Basic Grey papers and brads etc. Most of my paper is BG. I love the way the coordinate. my fave tool would have to be my bone folder I love a clean fold!, my fave gadget would be my cuttlebug! da ich leider keine cuttlebug habe. würde ich sagen scor pal und scneidemaschine. stickles benutzt ich im moment auch sehr gerne. Such a pretty card she created! I would have to say my gazillion dp,without it my cards would be so plain. Thanks for a chance to win Katharina! Enjoy your countdown til Christmas! Love the christmastree on the card! Well there are plenty of things I couldn't be without. I think I'd have to say my small straight decoupage scissors are my favourite. I love my Cuttlebug. It is so wonderful. Embossing is my favorite thing to do with it. I love that you can use other dies in it so I don't have to buy every cutting and embossing tool. What a lovely tree! My favorite tool is two-way glue. I use it for everything! My favorite thing that I can't live without is ribbon. I love how elegant ribbon can make a card. Thanks so much for your beautiful blog and generosity. Hugs. My favorite tool would have to be my cuttlebug because there are endless possibilities to play with it! Congrats on having all of your cards sent and presents bought! I haven't completed either of those yet! Thanks for the wonderful chance to win such a lovely stamp! Fran's card is gorgeous!!!! I think it would have to be my cricut. I love the things I can cut out with it. Only problem is I want all the cartridges! What a stunning card. I'm afraid to say I love photoglue too! I was thinking of it when I read your comment. Isn't it just magic! I totally love my paper cutter. Would not be able to finish anything without it. I do love this tree! Stamps! I find I use them on flyers for cub scouts, notes to the teacher, everything! Beyond that, my watercolor crayons and blender pens seem to see a lot of use. My favorite new tool is a Zutter. Which I have started making quick and easy gifts. Huhu was für ein wunderschönes Motiv. Mein Lieblingsgerät ist auch die Cuttlebug und meine Nesties. Die möchte ich net mehr missen. My favourite tool is my guillotine as it is the only way I can make a straight cut! My favourite product is any type of DST - the stickier the better. Doublesided tape... can't make any card without it. my favourite crafting tool or product? Erm, I don't have that many bits and pieces for my new bigshot just yet, so that's not really my favourite at the moment, although I am sure that it will be eventually! Right at this very moment it's my round corner punch, I love the way it turns hard squares and rectangles into soft shapes. I love my cuttle bug! My favourite craft tool is my paper cutter. I don't know how I used to manage without it! I couldn't be without my scissors. Everyone knows about it if I misplace them for 5 mins. They are rarely out of my hands! They are big but light enough for even the finest decoupage and accurate enough for straight lines. Love 'em ! Love that tree stamp: So much detail in it. My favorite craftingtool? I would choose my corner-rounder. Almost all my cards have rounded corners. I guess the Stickles glitter-glue is my favourite right now. My latest favorite is my Glue Glider Pro. Just love it. I have 2 favorite tools for my crafting one is my cuttlebug i just love it and the other is easy lift doublesided tape which i cannot do without. Beautiful cards today again, thanks for the opportunity to win the tree. My favorite tools are my copic markers. Thanks for the chance to win again. My favourite tool would have to be my Big shot and my embossing folders, I just love them. Well, I agree that it's hard to decide on just ONE favorite tool, but I would have to say my Cuttlebug is my fav for the moment...lol :) Thanks for this chance to win!